Platform PC, Xbox 360, Xbox One, PlayStation 3, PlayStation 4. There are some mysteries in the world that will never be adequately solved enough for our liking. How was Stonehenge erected? What’s the meaning of life? Why do birds suddenly appear, every time you are near? No matter how often we squabble about them, we’ll never reach a satisfactory answer. Yet, if you were to pose these to Sherlock Holmes, I doubt you’d find many who’d go out of their way to disagree with him. For most, Holmes’ word is law, and one that few would ever question. But, what if he were wrong? What if, for all his fancy posturing and skills of deduction, the world-famous detective caught the wrong man? Would we consider it a one-off, knowing that everyone is fallible and it’s impossible to be right all the time, or would we instead question his previous convictions and throw the legend of Baker Street’s most famous resident into doubt? It’s a premise seldom considered, but one which Frogwares are throwing right into the forefront of their latest sleuth-’em-up Crimes And Punishments. Marking Holmes’ seventh outing with the developers, it’s also the first in the series that doesn’t concern itself with tackling one continuous story. 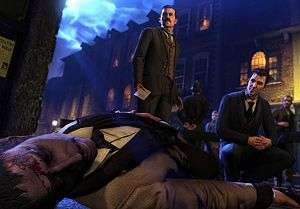 Instead, the action is spread out over multiple cases, with the overall arc concerning itself with the detective’s reputation. While previous tales would portray our hero as always getting his man, this is the first occasion where his infallibility will fall into question. The action began when Watson returned to 221B Baker Street, only to find Sherlock in the midst of danger once again. Taking control of the doctor, the player discovers that Holmes’ eyes are dilated, and his pulse is somewhere in the fifties, but fading fast. Quickly discerning that his beloved friend has been poisoned, Watson is upset further by the revelation that the culprit is none other than Holmes himself. Before we can question why the iconic detective was trying to poison himself, Lestrade shows up with another thrilling mystery for the dynamic duo. A murder has just occurred at the Roman Bath House, but there were several people in the steam room at the time of the crime, meaning that any one of them could easily be the guilty party. All of the suspects had a personal relationship with the deceased, but a spanner is thrown into the works as, despite no-one leaving or entering the crime scene since, there’s no sign of a murder weapon. The onus is thus thrust upon the player to gather as many clues as they possibly can in order to better understand the nature of the crime that has occurred, as well as get a better handle on who may or may not have ‘dunnit’. It’s by no means an open and closed case, however, with each mystery taking around three or four hours to solve, with a similar number of possible conclusions owing to the multiple suspects. 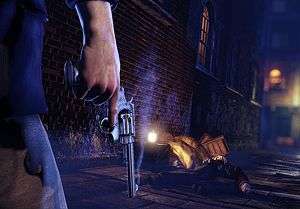 Collecting evidence is rather easy, with an on-screen prompt often enough to draw attention to the presence of a clue, while the player can also search the body for a better understanding of what may have happened. In this case, a sample of blood and the dirt under the corpse’s fingernails is a welcome start, but examining the pool of claret will also be a must. If players are unable to find anything pertinent, then now would be a good time to activate ‘Sherlock Vision’ – a new ability that renders the environment in grey while highlighting anything important with a bright yellow hue. With all the evidence gathered, it’s time to interrogate the suspects and witnesses. 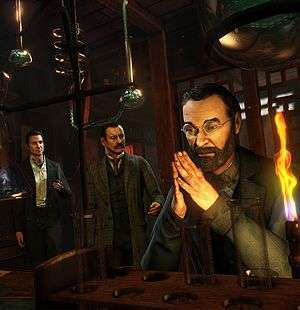 Before engaging in important dialogues, players can use Sherlock’s expert skills of deduction to pinpoint minor details about their adversaries. If anything they say contradicts any of the details he’s noted, then it’s possible for players to interrupt the conversation and counter with deduced evidence in order to find out the real answers. From here, it was time to travel back to Baker Street in order to further examine the evidence at hand. Whilst moving between locations, players can examine the notes and clues they’ve collected so far, allowing them to easily keep up to date with the case at hand. Unfortunately, it’s not possible to discuss everything with Watson, who’ll sit there in stony silence, rather than engage you in any meaningful conversation. It’s rather unfortunate as, despite his presence, Watson doesn’t seem to have any significant impact or feel vital in any way at the moment. Skipping forward to later on the case, we come across a puzzle that requires us to put a mould together properly, so we can pour some metal into it and see what shape it comes out as. It’s a rather innocuous puzzle that requires some basic rotation, but if it’s taking too long, then you can apparently skip it with no real consequences. Whether there will actually be repercussions outside of fewer achievement points remains to be seen, but the puzzle’s solution will give players a massive potential lead on what exactly happened to the murder weapon. While we weren’t able to see it in action, we’re also told at this point that certain cases will require Holmes to don one of his many famous disguises in order to pursue the mystery further. Although they’re not all available at the start, you’ll eventually be able to unlock a range of options for hats, glasses, hair styles, and facial hair, allowing London’s finest to look like an old, balding man with relatively little effort. A further fast-forward drops us squarely at the end of the investigation, with Holmes now forced to put the evidence together and point the finger at his preferred culprit. The process for this requires you to link several strains of evidence together in order to reach an appropriate conclusion, but it isn’t as cut and dried as it seems. One piece of evidence could have two possible explanations, while another could instantly shut down your current line of enquiry. To help keep you on the right track, you’re informed as to whether or not anything you’ve deduced contradicts itself, but each case is deliberately designed so that it’s possible to charge any of your suspects with the crime. While the culprit will never change in subsequent playthroughs, it’s not always made immediately clear to you if you’ve made the right decision or not, and neither will the game outright tell you if you’ve made the wrong decision. Instead, you’ll be clued in as to whether or not your assumptions were correct by the ending, with around nine different end-game states depending on whether you’ve either maintained Sherlock’s reputation by correctly locking up the murderers, or ruined it by consistently making sure the wrong man is convicted. Although I’ve not delved into the series before, the premise alone was enough to attract me to Frogwares’ newest take on Britain’s finest detective, but what I’ve seen so far makes me confident that it’s going to be an adventure to remember. 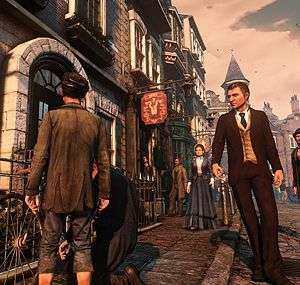 Bound to be Holmes’ greatest videogame yet, Crimes and Punishments is slated for a release later in the year on PC, PS4, PS3, Xbox 360 and the Xbox One.